The Ferrocarril de Sóller Catalan pronunciation: [ˌfɛrukəˈriɫ də ˈsoʎə] (English: Railway of Sóller), acronym FS, is an interurban railway and the name for the company which operates the electrified 3 ft (914 mm) narrow gauge tracks running between the towns of Sóller and Palma on the Spanish island of Mallorca (stopping at various smaller towns such as Bunyola and Son Sardina). The historic electric train takes a route north from the capital across the plains, winding through mountains and 13 tunnels of the Serra de Tramuntana, finally ending in the large railway station of the northern town of Sóller. Work began on the railway in 1911 on the profits of the orange and lemon trade, which at the time was booming. For this reason, it is sometimes known as the Orange Express. The famous train is now not only a mode of transport between these two key Mallorcan settlements, but also an attraction in itself. Single tickets cost €15 (2015), returns are €21. Palma Railway Station (Coordinates: 39°34′36″N 2°39′14″E﻿ / ﻿39.57667°N 2.65389°E﻿ / 39.57667; 2.65389) is a subtle, relatively small brown brick building with a large "Ferrocarril de Sóller" sign on its façade, partly given up to a museum, cleverly renovated so that the large glass windows reflect the railway tracks to make them look as if they go on into the rooms. The station is just off the Plaça de Espanya and borders a large and popular park which lies on top of the underground Estació Intermodal. Several old railway buildings (one with a large brick chimney) lie untouched in the park and there are several train-themed play structures, each one a carriage named after a settlement along the line. Sóller Railway Station (Coordinates: 39°45′53″N 2°42′54″E﻿ / ﻿39.76472°N 2.71500°E﻿ / 39.76472; 2.71500) on the other hand is much larger, developed from a fortified house dating from 1606, Ca'n Mayol. The station is also home to the tram which runs from Sóller to Port de Sóller and (inside the building) a museum dedicated to the works of Picasso and Joan Miró. 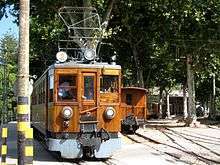 Video of Ferrocarril de Sóller on travelchannel.co.uk.